From 2013-17 only Mike Trout had a higher fWAR (44.2) than Josh Donaldson's (above) 34.3. KISSIMMEE, Fla. — There’s an unmistakable intensity to Josh Donaldson as he arrives at Braves spring training. Maybe there’s an element of trying to show the baseball universe he’s still the player who won the 2015 American League MVP. Maybe there’s some credibility to his gunning for a multi-year deal after an injury-riddled two seasons that led to him inking a one-year, $23 million deal with Atlanta. But after years of setbacks, the 33-year-old third baseman was simply healthy and refreshed. A left calf strain forced Donaldson to miss two months in the 2017 season and last year dealt with a sore shoulder and a further calf issue. 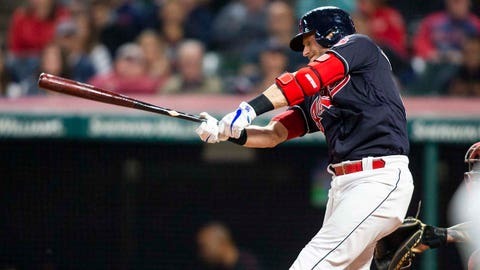 He played just 52 games — 36 with the Blue Jays before they dealt him to the Indians — and hasn’t played in more than 113 games since 2016. Despite his missed time in ’17, from 2013-17 Donaldson earned three straight All-Star nods, four straight finishes of eighth or better in the MVP balloting, two Silver Sluggers and during that five-season stretch only Mike Trout had a higher fWAR (44.2) than Donaldson’s 34.3. He’s done most of his damage hitting No. 2 in the order, carrying a .570 slugging percentage during his aforementioned peak that’s second-best in the majors in that span (also trailing Trout’s .576). So long as Donaldson can, most importantly, stay on the field. But it’s undeniable that Donaldson’s health the past two seasons played into the hands of the Braves and allowed Anthopoulos, the GM who after the 2013 season brought him from Oakland to Toronto, to bring him in again. Expected to be right alongside Bryce Harper and Manny Machado as this free-agent class’ most prized offensive weapons, the others remain unsigned while Donaldson took a one-year deal that’s an opportunity to regain his standing as an elite bat. Had he been healthy last season it’s impossible to think he would have signed a short-term deal. The Braves have been clear that rest will be a part of the formula this season, which they’re certain to implement with a player in Donaldson who is two years removed from playing a full year. They also have other options at third with Johan Camargo (115 wRC+) and Charlie Culberson (108 wRC+) — and Donaldson can slide into he designated hitter role in the Braves’ 10 interleague road games — but when asked how many games he believes he can reasonable play, Donaldson didn’t hesitate. Hence his desire to arrive at camp three days before position players are required to report, and with a focus that wasn’t lost on his new manager.